We are just over two weeks away from Christmas, which means now's the perfect time get your gifts for family, friends and that special someone (you!). We've compiled a mega gift guide just for the geeks this year, including the hottest books, video game accessories, and movies, not to mention collectibles. It's our way of making sure Robot Santa has something special in his sack for everyone. The moment we saw Baby Groot's gasp in the new Guardians of the Galaxy trailer, we wanted to squeeze his tiny, wooden face. You can put this little potted Groot on your desk, bookshelf, or even in your cupholder, but no matter where it goes, it will remind you of two mind-blowing facts: first, every time you hear him squeal "I am Grooooot!" in the movie, that's Vin Diesel. Second, this Funko Pop figure is close to actual size. Whoah. With Avengers: Infinity War on the horizon and everyone coming up with theories about who holds the Infinity Gems, Aftermath goes a step farther and shows the fallout from Thanos' defeat, along with the fate of the Gems. It's one of the classics of comics, and currently marked down almost 30% for fans who want to relive the epic saga before the movie comes out! If you (or a friend) don't already own a copy of this movie, you know what you need to do next. The rebooted Star Trek film saga introduced the awesomeness of Kirk, Spock, and the Enterprise to a new generation of sci-fi fans and showed just how many lens flares you can add before you start drawing some biting, incisive satire from media outlets. Either way, no one matches Abrams' vision for interstellar adventure and uber-cool aliens. Supply Pod is the premium subscription box curated by the professional geeks at Outer Places and delivered to your mailbox every other month. Every pod is themed and contains a relevant science kit and cool sci-fi items like exclusive T-shirts, variant cover comics, electronics, and fandom swag. To celebrate the release of Rogue One, this month's box is themed around "Rogues and Rebels"! In the ten years since this game came out, Lego has released a whole slew of fun, amazingly witty video games and movies based on beloved franchises. With a new chapter in Star Wars beginning with Rogue One, now's the perfect time to take a nostalgia trip back to a simpler, blockier world where Han Solo is still alive and everyone explodes into studs when you hit them hard enough. We got to see E.K. Johnston at NY Comic-Con 2016 just before Ahsoka came out, but we were already excited long before that. Over the course of The Clone Wars and Rebels, Ahsoka has become one of the legitimate breakout characters in the Star Wars universe, and this book bridges the gap between Ahsoka leaving the Jedi Order and her eventual appearance as a Rebel agent. This is just one of those super-cool science gifts that never gets old. The crystals in the kit are real calcite, and will grow larger the longer you keep them in their growing solution. After about a week, the crystals will reach their full size—and gain their vibrant color! Available in three colors and includes a stand. Between Harry Potter and the Cursed Child and the new Fantastic Beasts movie, Potter fans are basking in the glow of more witchcraft and wizardry. Though it's not a new novel, this beautifully bound copy of Fantastic Beasts' script is a must-have for all true fans. Unfortunately, the audiobook for Wizard People, Dear Reader is still unavailable. The Hobbit trilogy has endured a lot of criticism, but no one can deny the wonder, thrills, and sweeping adventure Bilbo Baggins brings to the screen with his crew of singing, growth-stunted facial hair enthusiasts. And true LoTR fans go for the extended edition—according to verified purchases, this collection's extended cuts of An Unexpected Journey, The Desolation of Smaug, and The Battle of the Five Armies include roughly 20-30 extra minutes of footage each. This speaker is rainproof, dustproof, sandproof, and water-resistant. It's got heavy bass with no distortion. It's wireless, weighs less than 10 ounces, and has a battery life of up to 7 hours. It connects to iPhone, iPad, iPod, Samsung, smartphones, tablets, laptops, Chromebooks, PCs, and even Kindles if you have a fundamental misunderstanding of how books work. Normally $99.99, it's $27.99 right now. This is the portable speaker you've been looking for (waves hand like Jedi). It's pretty insane to realize that we've reached the point where anyone with $50 can watch movies and TV shows, listen to songs, read e-books, use apps, and play games anywhere. The Amazon Fire is one of the cheapest high-quality tablets out there, and with Amazon coming out with all kinds of new shows (The Man in the High Castle), services (Amazon Fire TV Stick and drone delivery), and deals, the Fire tablet makes a great, affordable gift for any tech lover. We've reached a new level of nerd dedication. Before, it was enough to say wedding vows in Klingon, but now there is a Living Language Course for Dothraki. This course includes "a 128-page language guide and a one-hour audio CD featuring over 200 words and phrases, grammar explanations, cultural notes, a dialogue, and exercises for reinforcement" and includes words and phrases never seen in the show or the books! This is it. The communicator that inspired the flip-phone and (arguably) the entire mobile phone revolution. Not only that, it's a fully accurate replica created from scans of the original prop. It can also link with your phone via Bluetooth so you can answer calls by flipping open the cover, just like in the show. Did we mention it includes 20 authentic sound effects and that its stand is a contactless charger? Someone in your life needs this. It's probably you. Some people step out of the shower with a towel inexpertly tucked into their waist, and some people emerge from the bathroom as heroes. Look at that soft, pillowy fabric and sweet shield—they even got the pointed hood right. All you need is a loofah, a Big Key, and a walkthrough, and you're ready to conquer the Water Temple in your own home. If you're a fantasy gamer, your life has revolved around potions: mana potions, stamina potions, health potions...those color-coded little vials are hard-coded into your skull. Now you can light your room with this ThinkGeek exclusive, created by fans for fans. Screw lava lamps or nightlights—this cool little sucker cycles through four colors or sticks with your favorite, all while looking like it has a 1% drop chance. For Pokemon GO fans who go hard and the rest of us who just need some extra juice on long trips through the tall grass of Life, this portable charger has a micro-USB port and cable that charges many Android and iOS devices, as well as anything that needs a USB charger. It also has a built-in flashlight and a LED display that shows how much juice is left, as well as a one-year warranty. A great addition to anyone's Key Items pocket. Shower curtains and sun visors are two everyday items that have the potential to be simultaneously practical, useful gifts and amazing pledges to one's fandom. 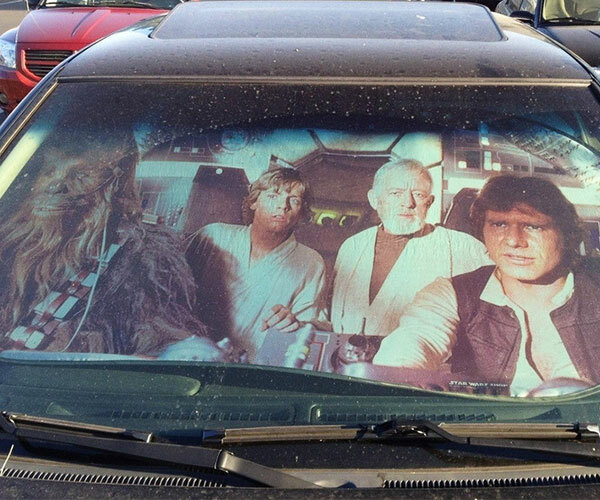 This is the kind of car accessory that helps you get the street cred you deserve and the sassy Princesses you desire, all while making a tasteful nod to one of the most iconic scenes of all time. We like to imagine that they're saying "That's no moon, that's a gas station." 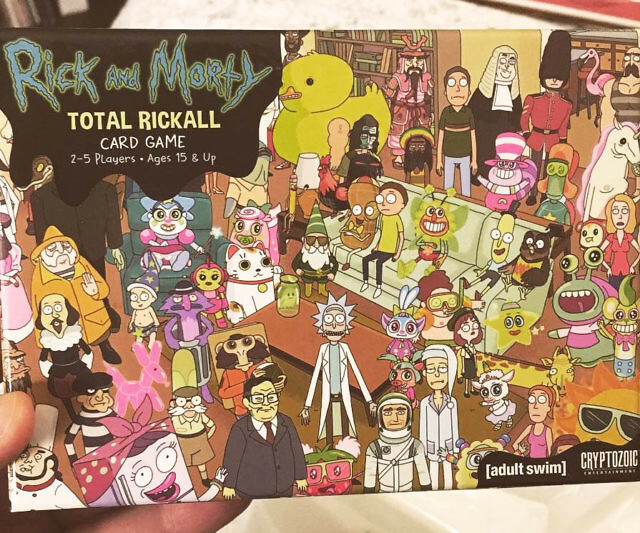 Veteran board game enthusiasts will be familiar with games like Coup and The Resistance, but of course Rick and Morty had to come along and screw everything up. Based on the premise of the hilarious Season 2 episode of the show, you play as a real member of the Smith family or one of the horrifying parasites masquerading as a long-time family friend...remember the barbecues? You loved those barbecues.